Speculation increased in the mid-19th century following the discovery that the number of spots seen on the Sun rose and fell in a regular 11-year cycle. It appeared that the sunspots reflected some kind of storminess on the Sun's surface  violent activity that strongly affected the Earth's magnetic field. Astronomers also found that some stars, which otherwise seemed quite similar to the Sun, went through very large variations. By the end of the century a small community of scientists was pursuing the question of how solar variability might relate to short-term weather cycles, as well as long-term climate changes. (3) Attempts to correlate weather patterns with the sunspot cycle were stymied, however, by inaccurate and unstandardized weather data, and by a lack of good statistical techniques for analyzing the data. Besides, it was hard to say just which of many aspects of weather were worth looking into. Other scientists were quietly skeptical. Abbot's solar constant variations were at the edge of detectability if not beyond. About all he seemed to have shown for certain was that the solar constant did not vary by more than one percent, and it remained an open question whether it varied anywhere near that level. Perhaps Abbot was detecting variations not in the solar constant, but in the transmission of radiation through the atmosphere. (9) Still, if that varied with the sunspot cycle, it might by itself somehow change the weather. Despite widespread skepticism, the study of cycles was popular in the 1920s and 1930s. By now there were a lot of weather data to play with, and inevitably people found correlations between sunspot cycles and selected weather patterns. Respected scientists and over-enthusiastic amateurs announced correlations that they insisted were reliable enough to make predictions. In the 1950s and 1960s, instruments on rockets that climbed above the atmosphere managed to measure the Sun's ultraviolet radiation for the first time. They found that the radiation did intensify during high sunspot years. However, ultraviolet light does not penetrate below the stratosphere. Meteorologists found it most unlikely that changes in the thin stratosphere could affect the layers below, which contain far more mass and energy. Still, the hypothesis of atmospheric influence remained alive, if far from healthy. By now it was clear that if you applied powerful statistical techniques to enough tree ring samples, you would sometimes turn up the 11-year solar cycle. Solar activity definitely had some kind of effect on climate in some places — but nothing obviously strong or consistent. For exaample, the 1970s saw controversial claims that weather data and tree rings from various parts of the American West revealed a 22-year cycle of droughts, presumably driven by the solar magnetic cycle. Coming at a time of severe droughts in the West and elsewhere, these claims caught some public attention. (26*) Scientists were beginning to understand, however, that the planet's climate system could go through purely self-sustaining oscillations, driven by feedbacks between ocean temperatures and wind patterns. The patterns cycled quasi-regularly by themselves on timescales ranging from a few years (like the important El Niño - Southern Oscillation in the Pacific Ocean) to several decades. That might help to explain at least some of the quasi-regular cycles that had been tentatively associated with sunspots. Evidence was accumulating that the Sun truly does change at least superficially from one century to another. Already in 1961 Minze Stuiver had moved in the right direction. Stuiver was concerned about peculiar variations in the amount of radioactive carbon-14 found in ancient tree rings. Carbon-14 is generated when cosmic rays from the far reaches of the universe strike the atmosphere. Stuiver noted how changes in the magnetic field of the Sun would change the flux of cosmic rays reaching the Earth. (28) He had followed this up in collaboration with the carbon-14 expert Hans Suess, confirming that the concentration of the isotope had varied over past millennia. They were not suggesting that changes in carbon-14 (or cosmic rays) altered climate; rather, they were showing that the isotope could be used to measure solar activity in the distant past. For the development of this important technique, a good example of laboratory work and its attendant controversies, see the supplementary essay on Uses of Radiocarbon Dating. In 1976, Eddy tied all the threads together in a paper that soon became famous. He was one of several solar experts in Boulder, where a vigorous community of astrophysicists, meteorologists, and other Earth scientists had grown up around the University of Colorado and NCAR. Yet Eddy was ignorant of the carbon-14 research  an example of the poor communication between fields that always impeded climate studies. He had won scant success in the usual sort of solar physics research, and in 1973 he lost his job as a researcher, finding only temporary work writing a history of NASA's Skylab. In his spare time he pored over old books. Eddy had decided to review historical naked-eye sunspot records, with the aim of definitively confirming the long-standing belief that the sunspot cycle was stable over the centuries. Eddy's announcement of a solar-climate connection nevertheless met the customary skepticism. He pushed his arguments vigorously, stressing especially the Little Ice Age, which he memorably dubbed the "Maunder Minimum" of sunspots. The name he chose emphasized that he was not alone with his evidence. It is not unusual for a scientist to make a "discovery" that others had already announced fruitlessly. A scientific result cannot flourish in isolation, but needs support from other evidence and ideas. Eddy had gone some distance beyond his predecessors in historical investigation. More important, he could connect the sunspot observations with the carbon-14 record and the new doubts about solar stability. It also mattered that he worked steadily and persuasively to convince other scientists that the thing was true. Satellite measurements pinned down precisely how solar brightness varied with the number of sunspots. Over a sunspot cycle the energy radiated varied by barely one part in a thousand; measuring such tiny wiggles was a triumph of instrumentation. (48) A single decade of data was too short to support any definite conclusions about long-term climate change, but it was hard to see how such a slight variation could matter much. (49) Since the 1970s, rough calculations on general grounds had indicated that it should take a bigger variation, perhaps half a percent, to make a serious direct impact on global temperature. However, if the output could vary a tenth of a percent or so over a single sunspot cycle, it was plausible to imagine that larger, longer-lasting changes could have come during the Maunder Minimum and other major solar variations. That could have worked a real influence on climate. A more promising approach pursued the possibility of connections between climate shifts and the slow changes in the Sun's magnetic activity that could be deduced from carbon-14 measurements. A few studies that looked beyond the 11-year sunspot cycle to long-term variations turned up indications, as one group announced, of "a more significant role for solar variability in climate change... than has previously been supposed. "(52) In 1997 a pair of scientists drew attention to a possible explanation for the link. Scanning a huge bank of observations compiled by an international satellite project, they reported that global cloudiness increased slightly at times when the influx of cosmic rays was greater. Later studies and reanalysis of the data found severe errors, and the authors themselves shifted from claiming an effect on high-level clouds to claiming an effect on low-level clouds. But the study did serve to stimulate new thinking. By the early 21st century, however, evidence of connections between solar activity and weather was strengthening. Extremely accurate satellite measurements spanning most of the globe revealed a distinct correlation between sea-surface temperatures and the eleven-year solar cycle. The effect was tiny, not even a tenth of a degree Celsius, but it was undeniable. Similarly weak but clear effects were detected in the atmosphere near the surface and, somewhat stronger, in the thin upper atmosphere. (56a) The practical significance of these effects was minor — after all, if the sunspot cycle had a truly powerful effect on weather, somebody would have proved it much earlier. The new findings, however, did pose an important challenge to computer modelers. A climate model could no longer be considered entirely satisfactory unless it could reproduce these faint, but theoretically significant, decade-scale cycles. Rough limits could now be set on the extent of the Sun's influence. For average sunspot activity decreased after 1980, and on the whole, solar activity had not increased during the half-century since 1950. 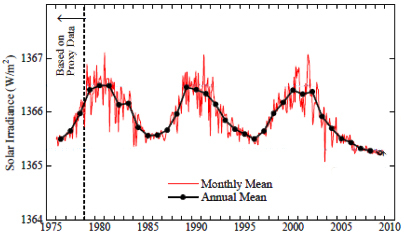 As for cosmic rays, they had been measured since the 1950s and likewise showed no long-term trend. The continuing satellite measurements of the solar constant found it cycling within narrow limits, scarcely one part in a thousand. Yet the global temperature rise that had resumed in the 1970s was accelerating at a record-breaking pace, chalking up a total of 0.8°C of warming since the late 19th century. It seemed impossible to explain that using the Sun alone, without invoking greenhouse gases. "Over the past 20 years," a group reviewing the data reported in 2007, "all the trends in the Sun that could have had an influence on the Earth's climate have been in the opposite direction to that required to explain the observed rise in global mean temperatures." It was a stroke of good luck that the rise of solar activity since the 19th century halted in the 1960s. For if solar activity had continued to rise, global temperatures might have climbed slightly faster — but scientists would have had a much harder job identifying greenhouse gases as the main cause of the global warming. When Foukal reviewed the question in 2006, he found no decisive evidence that the Sun had played the central role in any climate change, not even the Little Ice Age. The cold spells of the early modern centuries, experts were beginning to realize, could be at least partly explained by other influences. For one, a spate of sky-darkening volcanic eruptions that had triggered a period of increased sea ice which reflected sunlight from the North Atlantic region. Even more striking was evidence that the CO2 level in the atmosphere had dipped during those centuries — perhaps because so much farmland had reverted to carbon-absorbing forest as a result of plagues, including the Black Death in Eurasia and smallpox in the Americas. The greenhouse effect, even back then, looked like the dominant influence. The import of the claim that solar variations influenced climate was now reversed. Critics had used the claim to oppose regulation of greenhouse gases. But what if the planet really was at least a bit sensitive to almost imperceptible changes in the total radiation arriving from the Sun? The planet would surely react no less strongly to changes in the interference by greenhouse gases with the radiation after it entered the atmosphere. Some of the scientists who reported evidence of past connections between the Sun and climate changes warned explicitly that their data did not show that the current global warming was natural — it only showed the extreme sensitivity of the climate system to small perturbations. For more on temperature changes over the past millennium or so, see the conclusion and figure captions in the essay on The Modern Temperature Trend. Total solar irradiance (energy received from the Sun) as observed directly by satellites... minor wiggles while Earth's temperature soared. From the low to high point of a sunspot cycle, the change in "radiative forcing" (roughly speaking, the change in energy transferred to our planet) is equivalent to the interference in radiation passing through the atmosphere caused by 15 years of human emissions of carbon dioxide.